A few weeks ago I was cutting out some photocopy diagrams and pictures for my project. After a while, I got annoyed because it was so repetitive and tedious. Then I was thinking about the possibility of cutting my diagrams and pictures with only one cut. This way I could save some time and not getting annoyed at the same time. 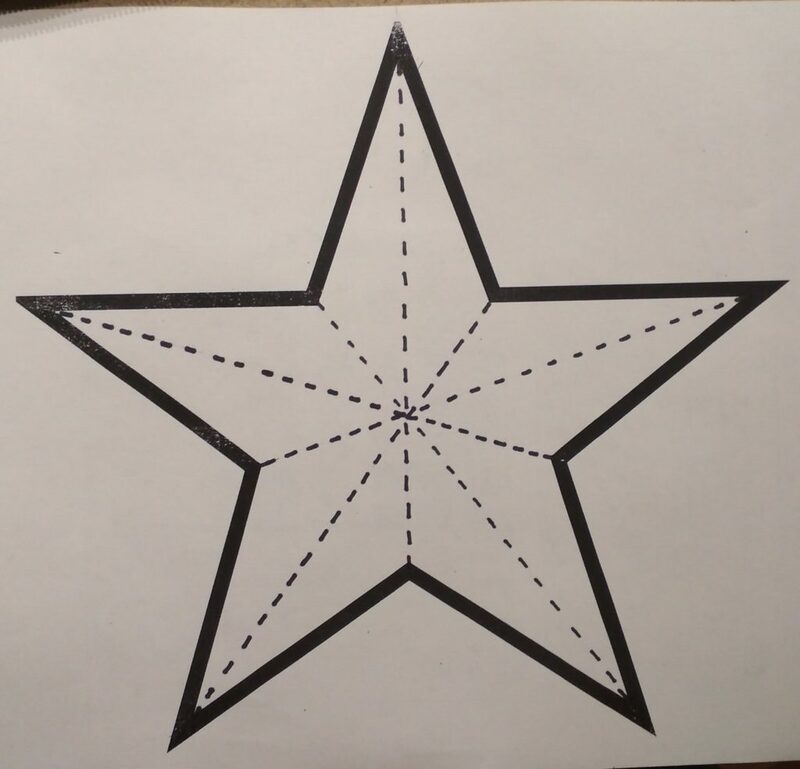 One of the diagrams that I remember has the outline of a star. My first instinct is to use the symmetric property of the star, so I fold it in half. Afterward, I realize that all of the five outer angles seems to be the same. Then I undo my fold in order to make the five outer angles overlapped. However it doesn’t end here, there is one more symmetric line from the last fold. At last, there is only one “side” remaining which is possible to cut in one. In conclusion, I realize the most important part to cut out a shape in one cut is to find symmetry within each shape. Since the star shape is a simple shape and can find at least one symmetric lines easily. So is it possible for the other shapes that are complicated and have no direct symmetric to cut at once? I used to think that it is impossible because it needs the symmetry element to achieve the goal of one segment remaining. Now I need to add a restriction towards these shapes – all of the sides must be straight lines since curves have a different properties case than straight lines. In this case, we need to “make” the symmetry ourselves with complex folds in a way that all sides are on top of each other. Through the study “Folding and Cutting Paper”, Erik D. Demaine, Martin L. Demaine, and Anna Lubiw arrived at the result of shapes that have even amount of vertices(points that are connecting all the outer sides to create a perimeter) can be folded in a way to achieve one cut. All other cases need at least two cuts. All of the above only remains true if the scissor is strong enough to cut the fold and the paper is large enough to allow that certain amount of folds. The shapes have a restriction on all of the sides must be straight lines. After the whole investigation process, I know that shapes with an even amount of vertices is possible to cut in one straight cut. In order to cut it, I need to find the “ultimate” symmetry or find a folding method that all the sides of the perimeter can overlap each other perfectly. With that in mind, I will definitely use this method of cutting classic geometric shapes. Otherwise, I will just deal with the boredom because it will take longer for me to figure out the symmetry. Plus my brain hurts from figuring out the symmetry for complex shape.